Sangoma has introduced the most cost-effective, easiest to provision and easiest to manage line of enterprise SBCs on the market. The four available options deliver maximum flexibility when selecting a solution. If you're an enterprise or a carrier, there is an option for you. All of Sangoma's enterprise SBC solutions feature an easy-to-use browser-based GUI and simple licensing plan based on number of sessions. For carriers, a similar, easy to use and deploy feature set and GUI is available, but it can scale to 4,000 sessions in a single chassis. 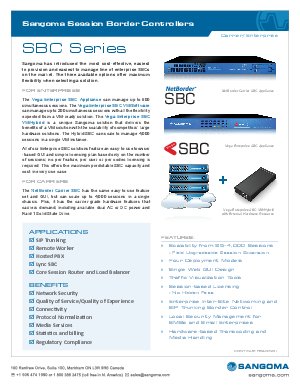 Learn how Sangoma Session Border Controllers can help you.